Me with my friend and running buddy Katharina, right before the start. We crossed the starting line AND the finish line holding hands. I could not have done it without her! The kids waiting for Katharina and me in McCarren Park in Brooklyn. 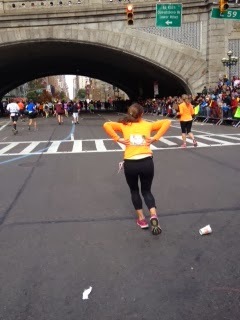 Coming off the 59th st bridge was the ABSOLUTE highlight of the race. It’s when you first enter Manhattan and is the stretch of the marathon where the fans are so loud and excited, their energy almost lifts you up off the asphalt and carries you down 1st avenue. Pointing at my sweet friend Liam on my back. Since the day Liam died, I have not stopped thinking about him and incorporating his memory into my daily thoughts. His death makes me want to continue my support to fight pediatric cancer, but also to more fully appreciate my children and my life. 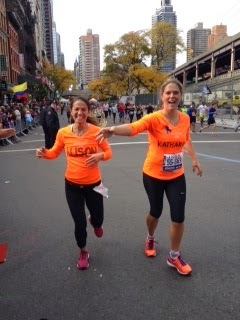 The hardest mile… mile 23… seeing my sister-in-law Erin was just the energy push I needed at that moment they call “the wall”…. With Bobby, Sydney, Maddie and Jack after I crossed the finish line in Central Park. Joy. Maddie with the marathon medal…proud of her mama. The after party and champagne celebration! My dad is my running inspiration. I have strong childhood memories of him going for jogs and wearing his old Saucony sneakers! My victory handstand after the race – my usual way to celebrate a moment is to go upside down!